Puerto Lumbreras - a small city 80 km from the city of Murcia. However, it has surprisingly varied landscapes for its size, the plains of El Esparragal being mainly dedicated to intensive agriculture, and the contrast of the upland area of Cabezo de la Jara. This area of great environmental interest contains predominantly Mediterranean type vegetation and woodland, Mediterranean pine, and even wild olive woods of great age. Sited at a key point between the Levante region and Andalucía, the Parador de Puerto Lumbreras is the ideal spot to explore the beauty of the Murcia region or inland Andalucía. 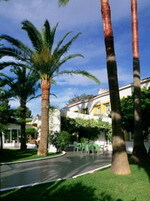 The hotel is perfect for relaxation and leisure and welcomes guests on working trips or holidays. The pool and the well-tended garden make it easy to relax and enjoy a pleasant stay, and the other spaces are decorated with elegance and good taste, with the outstanding light of the region enhanced by the pastel tones of the interior. In the Parador restaurant we especially recommend the excellent salads with local Murcia produce and rice from Calasparra. Enjoy also fish such as bream, meats such as lamb with garlic Cabañil style and desserts such as paparajotes (pastries) with honey.